Lumen5.com is a site where you can make a short book trailer video—for free. And it’s tons of fun. Ever since I found it, I’ve been having a ball making up videos for all my books. Well, not all: after all I do have 32 current titles out there. But I’ve been doing quite a few. Here’s a quick tutorial. Ex-homicide cop Lacey Fitzpatrick still keeps track of the LAPD’s investigations of murder cases. She’s shocked to read that an old cold case may have been cracked. When she asks how the case was solved, she’s told a medium provided clues. 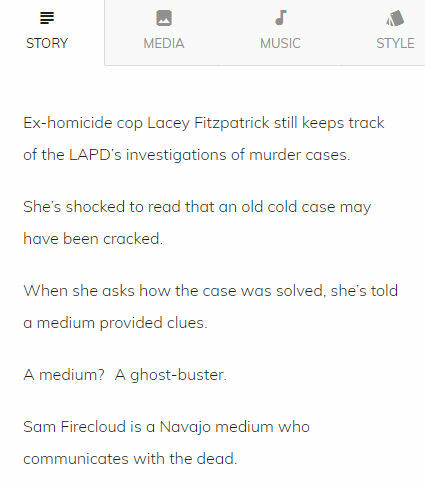 Sam Firecloud is a Navajo medium who communicates with the dead. Where no record of a crime exists. Available as both as a paperback and an eBook from Amazon. Next you’ll be prompted to choose a format: landscape, square, or vertical. In the free version, landscape is the only format available; in the paid version you may choose any of those. Then you’ll choose a theme. Note that the style of text and the text color (base color and highlight) will be what is shown in the example. You can change this at any time, so don’t feel like you’re locked in. Lumen5 will then assign your text in frames and suggest images to go with your text. I’ve found their suggestions aren’t usually what I want, but that’s no problem. They have a ton of stock images you can choose from, simply by searching for a subject. There are tabs at the top of the menu: Story, Media, Music, and Style. When you’re in the Story tab, your list of sentences will be shown in order. In the Media tab, you can select from many stock images and video clips, or upload your own images. Under Music, you can choose from a plethora of styles of music, from dark to upbeat, mellow to rock. And under the Style tab, you can change the style preference you chose at the beginning (text and color). When you’re in Story, you can select any sentence on the left, or a frame on the right, and compose, edit, and tweak the combination of text and images. You can change the highlighted word(s) or remove highlights altogether. You can move the text around to different parts of the frame to make sure the images are presented the way you want them. When you’re happy with all that, you can click on Music and select the best kind of music to suit your story. I haven’t listened to them all, but I had no trouble finding tracks that fit the mood of my trailer. As always, you can change that at any time. There are several paid versions available: $49/month for the Pro version for a single user, giving you the option of square or vertical format and custom theming; $149/month for the Business version which adds higher resolution and access to Getty images as well as custom watermarks; and the $399/month Team version which allows up to 3 users. I’m quite happy with the free version. I think it does a pretty good job for such a quick and easy process, and the customizing features give enough options for my needs. The best part is… it’s FUN. I had a ball playing around with images, music, highlighting the text. I’d encourage any author who’s shied away from complex book trailers to give it a try. I think you’ll enjoy it. Always a good thing when we’re doing book promotion, right? Very cool, Melissa, thanks for sharing! 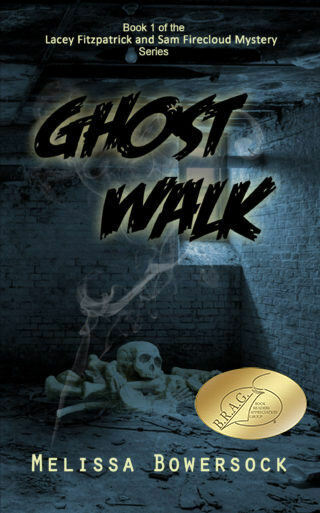 I enjoyed your trailer for “Ghost Walk” and the spooky music going along with it! I will have to give this a try! Yes, do, and let us know how you like it. I thought it was very fun! I really gotta thank you for this, Melissa. I made a trailer for my new book yesterday afternoon and sent it to my whole list today! The response is great. I didn’t find Lumen5 particularly user-friendly, took a while to figure it out, but….once I got the hang of it (and the slow speed), it opens up all kinds of marketing ideas. Really appreciate your sharing the site and your own trailer. I used my own photography and that made my trailer warm and personal. I did encounter a download issue…..not too sure about properly placing the link in an email. No one complained, but the email I sent to myself was problematic. More to learn! Beautiful Holidays to you! lumen5 is great. Even I can use it. Next Next post: Which “Sir Knight” Flash Fiction Story Gets Your Vote?